Noble material par excellence, the pearl of Jaquet Droz Petite Heure Minute 35 mm, gently kneaded and cut into one disc, free fascinating shades: royal blue, ocean, cobalt or indigo – depending on the play of light created by the movement of the wrist. The eight stars, lucky number of the House and placed randomly along the rays of the dial, draw a wonderful scene, comparable only to the beauty of a night sky. The design of the integrated bracelet steel genuine aesthetic and technical challenge, it goes perfectly with the asymmetry of the lines. Sweaters, different size, merge into a single line to wrap perfectly the profile of the wrist. 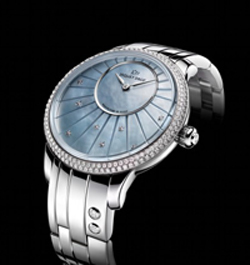 Diamonds emphasize the care of a timepiece created to celebrate the beauty of women. The Petite Heure Minute 35 mm evokes all the symbols of femininity in a jewelry-watch is added to the collection RElegance Paris. This new watch today’s woman is accompanied by the excellence of the ‘ Haute Horlogerie : a mechanical movement with automatic winding Jaquet Droz 2653, a power reserve of 68 hours and a bezel encrusted with 160 diamonds.